Join the Academy to honor Nancy Altman and Stuart Altman for their outstanding achievements in social insurance. 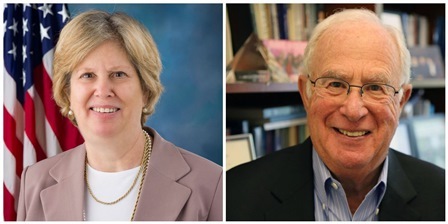 Nancy Altman and Stuart Altman were each honored by the National Academy of Social Insurance in Washington, DC, on Wednesday, June 27, 2018, with the 2018 Robert M. Ball Award for Outstanding Achievement in Social Insurance for their distinct accomplishments and extraordinary record of public service, scholarship, and leadership. Nancy J. Altman has a forty-year background in the areas of Social Security and private pensions and is widely recognized for her advocacy and deep commitment to social insurance. She is president of Social Security Works and chair of the Strengthen Social Security coalition. Ms. Altman was appointed to the Social Security Advisory Board by Democratic House Leader Nancy Pelosi for a six-year term, starting October 1, 2017. A Founding Board Member of the Academy, she recently completed two terms on the Academy’s Board of Directors. Professor Stuart Altman is an economist distinguished for his numerous contributions to federal and state health policy over the past five decades. He is the Sol C. Chaikin Professor of National Health Policy at The Heller School for Social Policy and Management at Brandeis University. A Founding Member of the Academy, Professor Altman has influenced countless other experts shaping today’s health care landscape. He has demonstrated leadership in health care policy as a government official and through service on government advisory boards, as well as other non-governmental policy and research groups.